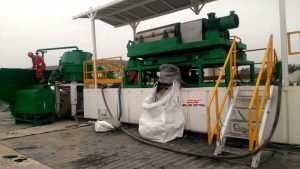 Below is the photo of GN drilling waste management system working for CNPC project successfully, the client is satisfied with the performance, the oil on the cuttings is below 5%, it can meet the environmental regulation for landfill or for disposal. 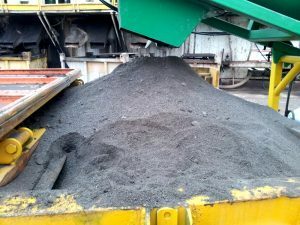 If the user need the OOC to be lower than 1%, we have Thermal desorption unit, the drilling waste management system can be used before TDU, it can save energy and save the operation cost of the TDU for the user. 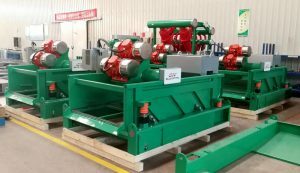 The drilling waste management system consists of VFD decanter centrifuge, vertical cuttings dryer, screw pump for feeding the centrifuge, screw pump as flushing pump of vertical cuttings dryer, mud tank for collection of the centrifuge fluids. The features of the GN decanter centrifuge: The goods quality and proper design can ensure the goods separation performance of the decanter centrifuge. 1) All the centrifuge bowl is made of duplex stainless steel 2205 or 2304, which is better than SS316 and SS304, the other components are made of SS316. The screw is made of SS304 by heating treatment. 2) The solids discharge port and fluids distribution port is interchangeable and protected by tungsten alloy. 3) The bearing is SKF brand bearing to ensure the longer working life. This week we shipped one unit of oil based drilling waste management system for CNPC, they ever bought similar system before for their domestic and international projects. 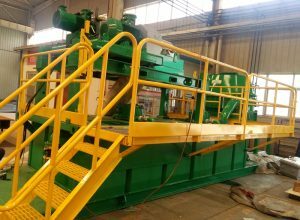 To get ideal result of the discharge cuttings and recover oil as much as possible, the performance of vertical cuttings dryer is the major concern. 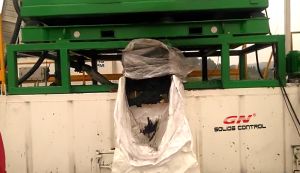 GN has a lot of successful experience for drilling waste management projects, our vertical cuttings dryer has been improved to E version from the year of 2013 when we firstly produce the vertical cutting dryer as per our client’s suggestion and site feedback. 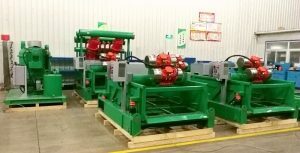 From the first A version to the existing E version vertical cuttings dryer, it has been more and more user friendly and maintenance cost has been reduced a lot. 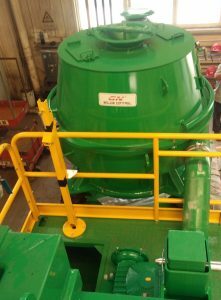 We have 900rpm, 1200rpm rotary speed for option to meet different requirement, the G force is up to 420G / 750G, and the screen basket opening can be 0.25mm, 0.35mm, 0.5mm for option for different drilling waste conditions. The screen basket and screen basket frame is separated, the operator only need to replace the single screen basket when it is wear. The independent oil lubrication system is for better lubrication of the bearing to prevent it from over heating. The automatic interlock system between oil pump motor, main motor and flush pump motor is equipped in case that the main motor starts before oil pump motor. 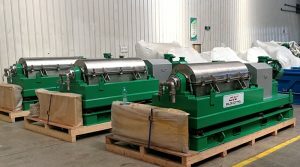 The decanter centrifuge is used after the vertical cuttings dryer to treat the fluids discharged from the vertical cuttings dryer, after treated by the centrifuge, the fine solids over 2 microns can be separated mostly, the fluids can be used to prepare for new drilling fluids or reuse directly. The high speed decanter centrifuge is used for low gravity solids, the max speed is up to 3900rpm. If you need oil based cuttings treatment system, pls contact with GN freely.